What do u think of NaruHina a NejiTen? Give me a good reason that they should be toegether. Why should they be together? Well it's actually pretty simple. Neji and Tenten have all the chemistry they need. They do not have any obstacles between them. They fit perfectly each-other and they are both great characters! 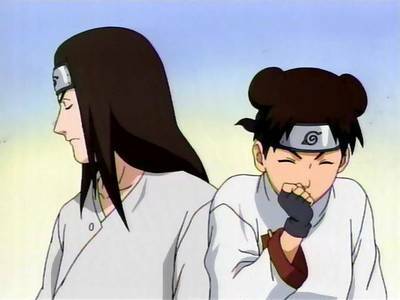 Neji doesn't like anybody else, and so doesn't Tenten. So they are free to love each other ^^. I personally really think this coupling will happen. A lot of Naruto fans love this coupling, including our friend here nejiten2 xD. And there is no good reason for Kishimoto not to put them together. So he probably will do whats obvious here. Well. They do have obstacles. Like Naruto currently liking somebody else. But that's is what makes fans love this couple even more. Because of the variety of the twist they are exposed to. I really do want and wish NaruHina happens! It should, because Hinata is the one who was waiting for him all along! She is the one that acknowledged him FIRST! He knows that whatever happens, she will always be there for him! She was willing to give her life for him! I think Naruto isn't really in love with Sakura. It was just a childish crush! And now he is afraid to make a change in his life! He got used to rejection, and he is confused cuz Hinata doesn't reject him. Of course there are a million meer reasons for making this couples come true, but I think what I just zei is enough! that is such a good reason of answer!! You-You, toatlly wrote something that is new to me!